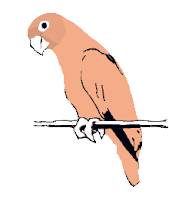 A burrowing parrot's sons were, like her, part of a colony of thousands of parrots. The grey-feathered birds made their homes in the hollows on the sides of the mountain. They'd lived there for longer than anyone could remember. The colony had gained strength. Their homes were full. Each year, the parrots dug their burrows a little deeper into the rock to make room for more parrots. The two brothers had grown to maturity in good health. Their father had died long ago but they were strong enough to offer assistance to their mother before the hatching and brooding season. Their mother had not shown interest in finding another mate. So it had become a tradition for the sons to enlarge their mother's burrow. In time, they thought, she would take a mate or they would bring their families to move in with her. One son had grown to be the alpha male for the colony. He led the largest groups in their migration flights. Many other birds gave way to him. They acceded even to his whims for food, nests, and drinking water. Now the only bird to whom he occasionally deferred was his mother. He was tough and wise and had married the strongest of females. His children were many. The other son had grown up to become an ordinary member of the colony. He was one of the weaker males, although considered wise. He had chosen a sickly mate out of love for her spirit. They had one child, now grown and out of their home. "I feel horrible today," announced the alpha parrot as he landed on the edge of his mother's burrow. "You look as strong as usual," his brother replied. "My looks are deceiving. One of my friends tried to poison me." His brother and his mother chirped at him. It was not unheard of for parrots to seek advantages over one another, especially near the top leadership positions of the colony. But it was alarming for them to hear of such things. "What makes you say that?" his mother asked. "He gave me a gift of seeds, as many do." The alpha male strode into his mother's burrow. The other two followed. "But the husks were poisonous." "Pardon me," said his brother, "but couldn't you see that the husks were on?" "Yes. I didn't care at the time. I thought I could gnaw off the husks. Isn't that what common parrots do?" "We do indeed," said his brother. His mother nodded. "That makes me feel stupid." The alpha parrot walked awkwardly. His stomach rumbled. He pecked once or twice at the back wall of the burrow. Even though he felt ill, his strength was greater than most. Flecks of stone fell from the wall. "I must have done a careless job of it." "That's not like you," said his mother. "I'm sure it can't be too bad." His brother joined him at the back where they had planned to expand the burrow. He also chipped away at the wall. "Perhaps you were sloppy. But you still couldn't have eaten many husks." "I'm not accustomed to feeling ill."
"You'll get through it. You're the strongest, after all. You've been enormously successful." "Not today. I hate to disappoint you, brother. Today, I'm sick and an idiot." "I've admired how it hasn't kept you from doing great things.,” said his brother. "But I've always thought you were an idiot."